Pathfinder Traffic Safety Services offers classes in Teen Driver Education for students up to the age of 18, Adult Test Preparation for both written and driving exams given by the DMV, and an Alcohol and Drug Education Class with Victim Impact Panel for DUI citations. Pathfinder Traffic Safety Services now offers teen driver education through a hybrid class format. In select locations, students will be allowed to complete their textbook review online, at the student's convenience. When tuition is paid, a student will be given access to the etextbook and worksheets. Completion of the worksheets is a non-negotiable requirement. Finishing the coursework ensures a seat in the classroom. The student will be required to email the completed worksheets to our office the evening prior to the first day of class. Failure to do so will result in the student's registration being moved to the next available opening in a class at that site. This format reduces the DMV required twenty hours of classroom "seat time" to ten. Upon completion of the course, the student's name and permit number will be submitted to the DMV. 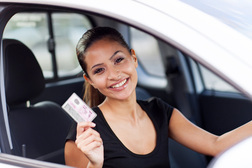 At age 16, the student may apply for the temporary Provisional Operator's Permit from the DMV website. In most cases, this can be accomplished online. Some unique situations may require a visit to the DMV court house office. Students who are 18 and older may take driver's education, but have to "drive test" with the DMV examiner. For more information and dates of our classes visit the Current Schedules page. Like to register for classes with Pathfinder Traffic Safety Services? Make sure to take a look at our Registration page.